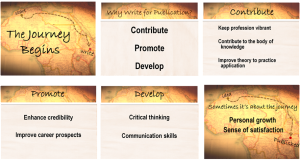 WHY CHANGE YOUR PRESENTATION STYLE? Do you have some slides with a list of bullet points on them? If so, why not select one for a slide makeover? It’s a great way to simplify your slide and “recycle” it into a more engaging presentation visual. First, remove anything that is purely decorative (like clip art). It is often distracting and does not add anything to your message. Next, carefully review each phrase or sentence on the slide. Remove any words that are not absolutely necessary. Remember the slide is there to amplify or enhance your words, not to repeat/replace them. Leave the most important numbers or words; they don’t have to be in full sentences. Finally use the 3 second rule on your slide. For a live presentation the audience should be able to read whatever is on the slide in 3 seconds or less. Try to keep one idea or point per slide. A slide that has multiple bullet points can be broken up into multiple slides. Some people think the number of slides dictates the length of a presentation; it is actually the amount and complexity of information you are trying to get across. 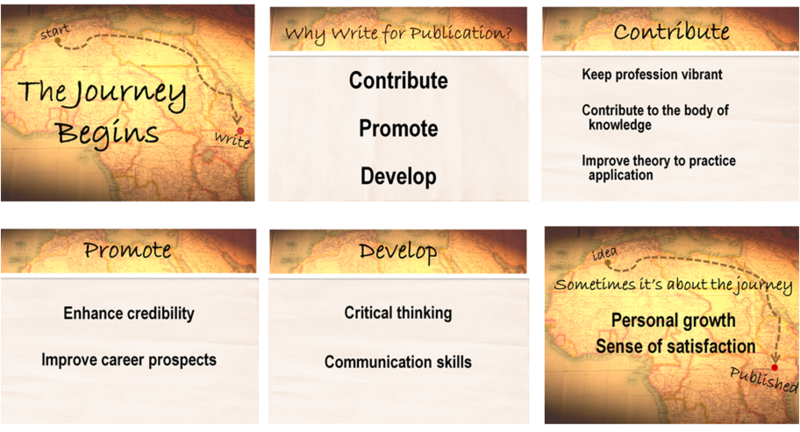 Here’s an example of a slide from a presentation I had the opportunity to makeover. 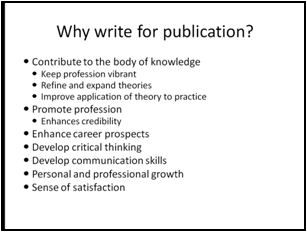 The presentation was to be given at a national conference, it was about how/why to write professionally. The example is used with permission. I re-designed the slide into a series of 6 slides (I also added color and a theme but those are topics for another day). Please let me know if these tips work for you. Perfect timing, this post of yours. Tomorrow morning I’m working with RRC’s Pharmaceutical Manufacturing students on presentations…Can I pull up your website during class? Don’t forget to let some passion shine through. Are you working on your swing? The medium is the message: your slides vs. your message. The less than helpful metaphor: The sales doctor and customer patient. How can you be impossible to ignore? When 10 x 1 = 1. How do you rate experience? The remarkable reason why so many presentations are boring. How does a professional salesperson grow their business? By working on their swing. Why not put an end to boring communication? How you can kick the CRAP out of (or is that into?) your presentation visuals.